A military drone strike on terrorists becomes complicated by the presence of a child in the firing line. Hood sets up some simple elements that effectively rack up the tension; the loaves of bread on the little girl's stall is a wonderful, Hitchcockian device that visually acts as an ambiguous and nerve-wracking countdown, causing us to shout at the screen for passersby to purchase some bread. Hood's loaves of bread generate as much nervous sweat as Hitchcock's glass of milk in Suspicion. 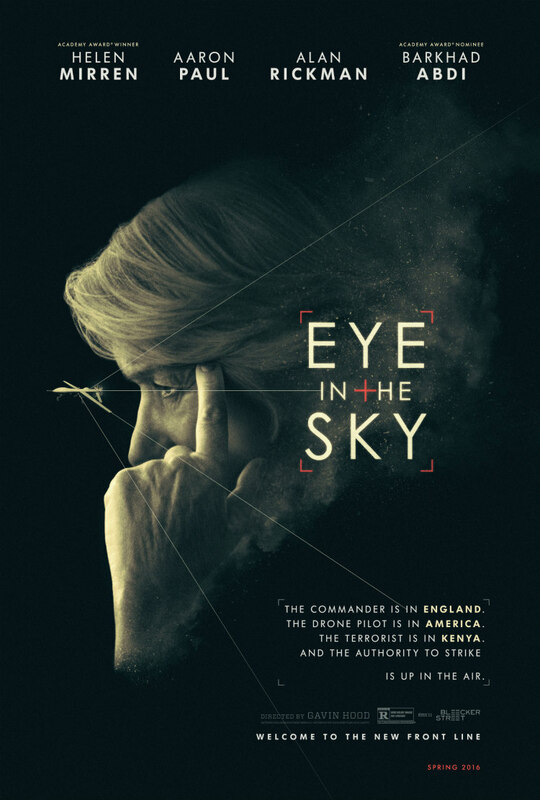 South African actor turned director Gavin Hood addressed the controversial topic of drone warfare through allegorical means in his 2013 adaptation of the young adult novel Ender's Game; now he's tackling it head on with Eye in the Sky, which is actually a lot more ambivalent on the morality of this new weapon. You'll probably already have a position on this subject, and Hood's film is unlikely to sway you. Because of this, Eye in the Sky is a movie that should work for the vast majority of its audience. The central argument against the use of drones is that it's more cowardly to drop bombs from an unmanned craft while seated in the comfort of a portacabin outside Las Vegas than to drop bombs from a plane you've actually flown into enemy territory. It's a classic white privilege issue - do we really believe the brown people we're bombing distinguish between the origins of the weapon about to disintegrate them? At one point, when arguing with a politician who accuses him of being heartless, Alan Rickman's British General tells her, "Never tell a soldier he doesn't know the cost of war!" 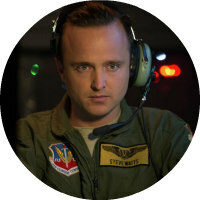 On a US airforce base in Nevada, drone pilot Steve Watts (Aaron Paul) learns such a cost when he becomes the trigger man in a joint British-American-Kenyan operation intended to take out a group of terrorists preparing for a suicide bombing in the Kenyan capital Nairobi. Leading the operation in the UK is Colonel Katherine Powell (Helen Mirren), bossing about the males under her command in stark contrast to the images from Nairobi where women are admonished for revealing their wrists in public. At ground level in the Kenyan city is secret agent Jama Farah (Barkhad Abdi,), who has infiltrated the terrorists' safe house with an insect sized flying camera drone (the improbable technology is the one aspect that took me out of the film, or am I being naive about such things?). When this camera reveals an array of suicide vests and explosive equipment, it seems a cut and dry case of taking out the terrorists, but the arrival of a young girl selling bread outside the house complicates the issue, both morally and legally. 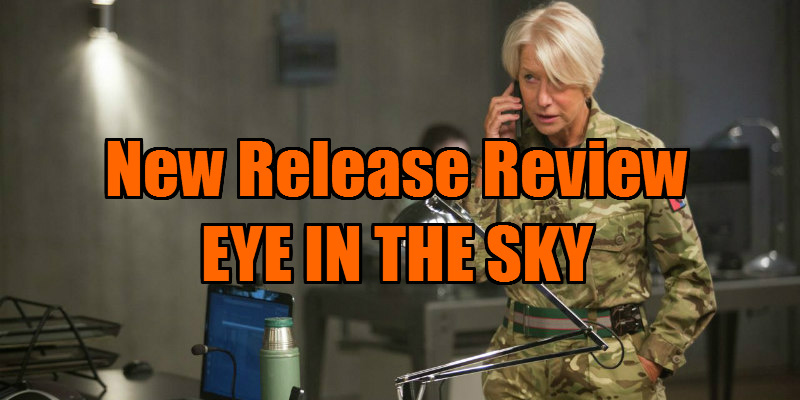 Set for the most part in real time, Eye in the Sky is an incredibly tense 'war on terror' update of cold war dramas like Sidney Lumet's Fail Safe and Stanley Kubrick's Dr. Strangelove (minus the comedy, save for a jarringly out of place, silly subplot involving a politician's bowel movements). Hood sets up some simple elements that effectively rack up the tension; the loaves of bread on the little girl's stall is a wonderful, Hitchcockian device that visually acts as an ambiguous and nerve-wracking countdown, causing us to shout at the screen for passersby to purchase some bread. Hood's loaves of bread generate as much nervous sweat as Hitchcock's glass of milk in Suspicion. Yet while the drama revolves around saving this girl, we're constantly reminded that should the terrorists be allowed to leave in order to save her, the result will likely be dozens of lives lost. This is the world we live in now, the wars we fight. War is never clean, but the world's been dragged into a particularly dirty one here, and as Aaron Paul's tear-stained trigger-man attests, even its heroes no longer have the option of a truly clear conscience.